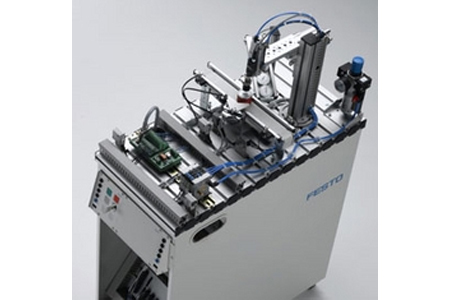 SLT slide units from Festo can be used to further extend the versatility of the Pick&Place module. With variable stops, silencers and an attachment that can be adjusted in all directions, the ideal solution can be found for all Pick&Place tasks. This permits a wide range of project work. Vacuum generators, pressure switches, vacuum filters, suction grippers. The vacuum components are harmonised for optimum performance. They clearly demonstrate the principle behind vacuum applications: vacuum generation using a generator, the correct suction cup with matching filter and the electronic pressure switch with teach-in switching points for pressure sensing.